Since 1927, this theatre was known as the Alvin. It was renamed in 1983 to honor America's most prolific playwright, Neil Simon, following the successful engagement of Brighton Beach Memoirs, the first play of an autobiographical trilogy about his youth with his family. Fittingly, in 1985, the second play of Mr. Simon's trilogy, Biloxi Blues played there successfully. In 1992, Mr. Simon returned again with his play, Jake's Women. 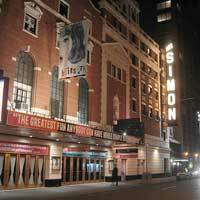 Since 2000, the Neil Simon has been filled with music and dancing as the home to two of Broadway's most popular productions, namely the acclaimed revival of The Music Man and the Tony Award-winning Best Musical, Hairspray.